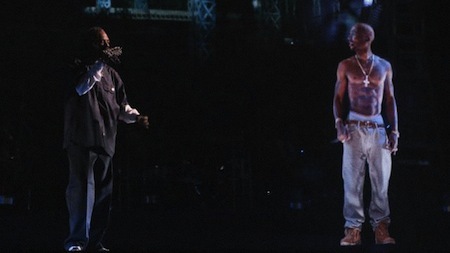 Fans of classic hip-hop were stunned when rap legends Snoop Dogg and Dr. Dre were joined onstage by a highly realistic three-dimensional Tupac Shakur, who died of multiple gunshot wounds sustained during a drive-by shooting in Las Vegas in 1996. This wasn’t a hologram at all. Rather, it was a clever optical illusion technique known as "Pepper’s Ghost," which dates back to a technique first described by an Italian scientist in the 16th century. Via Ars Technica. Thanks as always to Moira for suggesting and researching this story (btw, videos have been removed from Youtube).